CIQUARD, FRANÇOIS (baptized François Roussel), Roman Catholic priest and Sulpician; b. 30 Aug. 1754 in Langlade, France, son of François Roussel Ciquard and Luce Gautier; d. 28 Sept. 1824 in Montreal. 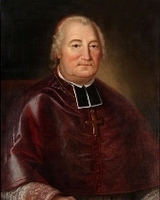 François Ciquard, who came from a humble background, entered the well-known college run by the Jesuits at Billom in 1771; after six years of study there he took his theology at Clermont-Ferrand. To support himself he tutored a boy from the town. Drawn to an ideal of perfection, after some hesitation and a trip to Sept-Fons he entered the Sulpician seminary in Clermont on 30 Oct. 1779 and was ordained priest on 22 Dec. 1781. For a while he served as a curate, and then he asked to be allowed to join the Sulpicians. He arrived at the Séminaire de Saint-Sulpice in Paris in May 1782 and did his solitude (noviciate) there. During his stay he informed the superior, Jacques-André Emery, of his desire to serve in the mission field. When Étienne Montgolfier* sought recruits for the Séminaire de Saint-Sulpice in Montreal, Emery persuaded Ciquard to leave for the province of Quebec with Antoine Capel. Since the royal instructions of 1764 did not allow French priests into the province, Ciquard went to England dressed as a layman, with a passport that termed him a merchant, and he finally reached Quebec on 21 May 1783. After a short visit with Bishop Jean-Olivier Briand*, Capel and Ciquard went to Montreal, where Montgolfier welcomed them with open arms as the first priests to arrive from France since the conquest. 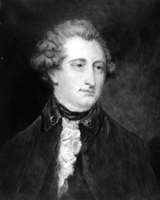 But Governor Frederick Haldimand*, who was opposed to the recruitment of clergy through immigration, decided to expel them, even though a petition from parishioners in Montreal was presented by Jean-Baptiste-Amable Adhémar* and Pierre-François Mézière. Ciquard was arrested in Montreal on 19 June and put on board a ship at Quebec. As he was ill, he obtained permission to land temporarily at La Malbaie. He seized the chance to flee and returned to Montreal. Retaken and again arrested, he embarked at Bic on the frigate Pandore and reached Paris on 20 Sept. 1783. Ciquard was appointed professor at the Séminaire de Bourges, and then bursar at the Petit Séminaire there. During the French revolution he took refuge in Orléans. Subsequently he agreed to join three other Sulpicians to assist the bishop of Baltimore, John Carroll. On 7 Oct. 1792 he arrived at Passamaquoddy Bay (Maine/N.B. ), and Carroll entrusted him with the Abenaki mission at Penobscot (Castine, Maine). But when the American authorities refused to grant land to the missionaries and the Indians, they left the United States and in May 1794 sought asylum in New Brunswick, settling at Saint-Basile in the Madawaska region. Ciquard went to Quebec in June and was recognized by the British authorities there and in New Brunswick. 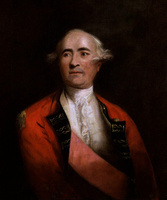 He even received an annual allowance of £50 from Thomas Carleton*, the lieutenant governor of the latter colony. Returning to New Brunswick, he began ministering to some Acadian families and Indians at Saint-Basile. Although he had been warmly welcomed, Ciquard recorded nevertheless that the Acadians did not fully respond to his exhortations and that the Indians did not want to work and disappeared during the winter. He paid a visit to Bishop Jean-François Hubert* in 1796 and then went to Montreal to see his former confrères again. In the summer of 1798 Bishop Carroll invited him to join Sulpician missionary Michel Levadoux at Detroit. After serving there for some months Ciquard left in May 1799. He returned to his flock in the Fredericton area and got on better with the Indians and the French-speaking parishioners than he had before. Despite his poverty he made donations to nuns in Lower Canada and to various charitable endeavours. In the summer of 1802 he went to Quebec again and met Bishop Pierre Denaut*. The following year Denaut put him in charge of the parish of Caraquet, N. B., but the priest there did not want to surrender his post. Ciquard, distressed by this experience, was transferred to Memramcook, replacing Thomas Power, who nevertheless continued to live in the parish. At first Ciquard gave his predecessor a third of his tithes; after Power’s death in 1806 he was a little better off. He was already beginning to think of his retirement and wanted to return to the Sulpician seminary in either Montreal or Baltimore. 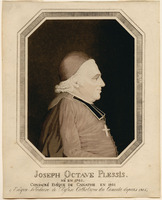 In August 1812 the bishop of Quebec, Joseph-Octave Plessis, put him in charge of the parish of Saint-François-du-Lac and the Odanak mission, in Lower Canada. Ciquard, who had a good grasp of the Abenaki language and who had secured permission to take up residence in the province, chose to live in the presbytery at Odanak, judging that since the mission had been left without a priest for 30 years, it was in greater need of his presence. His material circumstances were precarious, but Ciquard was able to adapt to an ascetic régime. The division of time he was required to make between the mission and the parish earned him criticism from people at Saint-François-du-Lac. To prepare for his replacement at the mission Bishop Plessis appointed seminarist Jacques Paquin* as his assistant, so that Ciquard could teach him the Abenaki language. 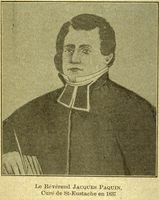 Paquin was ordained in 1814 and Plessis named him to the mission in October 1815. 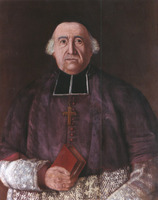 Ciquard returned to the Séminaire de Saint-Sulpice, was admitted as a member of the community on 23 Oct. 1815, and was immediately made assistant priest in the parish of Notre-Dame in Montreal. He replaced Jean-Henry-Auguste Roux as chaplain to the sisters of the Congregation of Notre-Dame, and in addition he had the task of visiting and tending the sick in the neighbourhoods to the west of the parish. That year he also took on the chaplaincy of the Congrégation des Hommes de Ville-Marie, a Marian brotherhood active in the community, and after 1817 he held the chaplaincy of a women’s organization in the parish, the Confrérie de la Sainte-Famille. He preached in church about ten times a year, including one or two sermons during the novena of St Francis Xavier. Although at times stilted and solemn, his style was none the less lively and agreeable. François Ciquard thus had a busy old age. His presence and his pastoral activity were greatly appreciated by his fellow Sulpicians, most of whom were also French in origin. He was stricken suddenly with hemiplegia and died within two days, on 28 Sept. 1824; he was buried in the crypt under the chancel of Notre-Dame in Montreal. François Ciquard’s large collection of papers, which Sulpician Jean-Baptiste-Elizé Philpin de Rivières consulted for an unpublished biography, is at the Arch. of the U.S. Province of the Sulpician Order, St Mary’s Seminary and Univ., Baltimore, Md., RG 52, Box 1: 581–676. Ciquard is the author of Portrait d’un missionnaire apostolique (Québec, 1810), the manuscript copy of which is at ASSM, 36, no.13. AAQ, 22 A, V: 511; 1 CB, VI: 21–22; IX: 129; 71–31 CD, I: 192, 197, 202, 216; 7 CM, I: 8; 311 CN, III: 15, 18–22, 24, 27, 29–30, 32–42, 44–56, 58–63; IV: 7, 67; VI: 26; 26 CP, II: 111. AD, Puy-de-Dome (Clermont-Ferrand), État civil, Vic-le-Comte, 30 août 1754. ANQ-M, CE1-51 30 sept. 1824. ASSM, 24, dossier 6; 25, dossier 2; 49, dossier 23. Allaire, Dictionnaire, 1: 124. The Catholic encyclopedia, ed. C. G. Herbermann et al. (15v., New York, 1912), 14: 329–32. Gauthier, Sulpitiana. Louis Bertrand, Bibliothèque sulpicienne ou histoire littéraire de la Compagnie de Saint-Sulpice (3v., Paris, 1900), 2: 60–62. [Pierre] Boisard, La Compagnie de Saint-Sulpice; trois siècles d’histoire (s.l.n.d.). T.-M. Charland, Histoire de Saint-François-du-Lac (Ottawa, 1942), 213–28. A. [-H.] Gosselin, L’Eglise du Canada après la Conquête (2v., Québec, 1916–17), 2: 192, 194–97. Laval Laurent, Québec et l’Église aux États-Unis sous Mgr Briand et Mgr Plessis (Montréal, 1945). J. W. Ruane, The beginnings of the Society of St. Sulpice in the United States (1791–1829) (Baltimore, 1935). “Le gouverneur Haldimand et les prêtres français,” BRH, 12 (1906): 248–52. Olivier Maurault, “Le troisième centenaire de l’arrivée des sulpiciens à Montréal, 1657–1957,” CCHA Rapport, 24 (1956–57): 55–63. Fernand Ouellet, “Mgr Plessis et la naissance d’une bourgeoisie canadienne (1797–1810),” CCHA Rapport, 23 (1955–56): 83–99. Bruno Harel, “CIQUARD, FRANÇOIS (baptized François Roussel),” in Dictionary of Canadian Biography, vol. 6, University of Toronto/Université Laval, 2003–, accessed April 24, 2019, http://www.biographi.ca/en/bio/ciquard_francois_6E.html.